and Spraying Machines Klusmeier, Inc. The Porta-Seeder truly is a multi-purpose machine: It can keep busy all year long performing a variety of tasks and, in the process, produce a very healthy ROI (Return On Investment). No question about it, this machine knows how to "earn its keep." Self contained: Come complete with 100 ft. hose, shut-off nozzle with tip; triple-function pumping system which both agitates and pumps the seed slurry (no seed damage) and can be switched to draft water out of tanks, ponds, or streams; Integral 150 or 300 gal. Main tank and 15 gal. 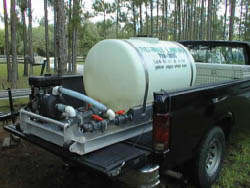 auxiliary tank; 5 hp engine; fits in a compact pickup truck and a 300 gallon fits into a full size pickup. Corrosion Free: Only high-strength plastics and stainless steel components are used. Safe: No belts, chain drives, levers, gears, paddles. Klusmeier, Inc. is an exclusive distributor of Canfor in Florida. For more infomation visit www.canforeco.com.